As we already know, photovoltaic solar cells produce continuous DC (direct current) power and therefore when a photovoltaic solar system is required to connect directly to the mains electricity grid or contains an AC (alternating current) load, a DC to AC conversion of the electrical power is required. The Solar Power Inverter provides that DC to AC conversion using electronic switching techniques. The Solar Power Inverter is an important electronic device that converts the electrical power generated by the PV solar array into a clean AC power supply suitable for feeding directly into the power grid. The typical application of a single solar power inverter is to convert the low input voltage into a higher conventional household AC mains power supply of the correct frequency and voltage, allowing us to use electrical appliances when an AC mains electricity supply is not available. In practical terms, the inverter allows us to run electric drills, computers, vacuum cleaners, mains lighting, and most electrical appliances that can be plugged into the wall sockets. If the power inverter is big enough, then larger appliances such as freezers, refrigerators, and washing machines can also be used. All these standard 120 or 240 volt AC appliances can be powered directly from either the PV solar array, or by converting the power stored in backup batteries using the appropriately sized solar power inverter. Inverter operation is quiet and its output power is available whenever it is needed so now stand alone battery systems can run just about any standard commercial appliance, 24 hours a day. While a single inverter may well be sufficient for a domestic installation, multiple units become the norm as we advance up the power scale and their efficiency, reliability, and safety are major concerns of the system designer. Central Inverter Configuration – Several branches of the array are connected together in parallel. The complete output of the array is converted to AC through a single central solar power inverter and then fed to the grid. The single inverter is presented with a DC input voltage and current which may be quite large depending upon the configuration of the array. This type of inverter configuration gives good efficiency, low cost, average reliability and since the PV panels within the same array are evenly matched, the maximum power point tracking (MPPT) selected by the inverter for the whole array ensures that all the PV panels operate at, or close too, their maximum power output. Branch Inverter Configuration – Each branch or string has its own inverter attached. Then each single branch can have a different number of PV panels, different panel types, positions, orientations or suffer from full or partial shading. The result is that each inverter produces a different power output relative to its connected array. Therefore the array cannot be efficiently characterised by one single maximum power point (MPP), as each inverter will operate at a different maximum power point with respect to the others. The main advantage of this type of power inverter configuration is that each solar branch can be at a different location or position and not all together in one single array. Individual Inverter Configuration – Each photovoltaic solar panel has its own power inverter. This enables the inverter to select the optimum power point for the panel giving very good efficiency but at a higher cost per kWp. More components in the array means lower reliability and more maintenance. An increasing number of solar panel manufacturers are offering individual PV panels with solar power inverters built directly into the PV panel, making each solar panel its own complete AC power source allowing it to be plugged directly into the mains grid. Grid connected solar power inverters synchronise the electricity they produce with the local grids AC grade electricity, allowing the system to feed the solar made electricity directly into the grid, usually through a second electricity kWh “net” meter. Most grid connected power inverters are designed to operate without backup batteries, but battery based inverter models also are available. The battery based inverters for use in both stand alone and grid connected solar systems, generally include an inbuilt battery charger, which is capable of charging a battery bank directly from the grid during cloudy or bad weather. High quality solar power inverters are available in sizes from a few 100 watts, for powering lights, laptops and games consoles from your car, up to tens of kilowatts, for powering large residential solar system with grid connected inverters being designed to automatically shut down when there is no grid power available for safety reasons. Solar inverters are available in a wide range of power sizes and voltage ratings to suit just about every combinations of installation but there are basically three kinds of DC to AC solar power inverter: square wave, modified sine wave, and pure sine wave. The Square Wave Solar Power Inverter is the simplest and the least expensive type of inverter available. It is generally not used commercially due to its low quality of output power and very large harmonics. Square wave inverters equipped with thyristor output stages chop and invert (hence the name Inverter) the DC input positive power to generate a square wave alternating positive to negative AC output signal that is later filtered to approximate a sine wave and eliminate undesired harmonics. Cheaper square wave inverters may also use push-pull transistor circuits with step-up transformers to produce the required output voltage. Square wave inverters are really only used in small stand alone PV systems that will run simple things like lighting or hand tools with universal motors with no problem – but not much else. The Modified Sine Wave Solar Power Inverter also called a quasi-sine wave inverter, is basically a modified square wave inverter which produces a square wave output with low harmonic distortion and a small “OFF” time between the positive and negative half cycles as the inverter switches polarity. Modified sine wave inverters are suitable for most types of electrical and electronic loads, and are a popular type of inverter on the consumer market today due to their good conversion efficiency, relatively low cost, and can be used in solar installations where waveform shape is not too important. However, modified sine wave inverters may not allow printers, copiers, light dimmers, rechargeable and variable tools to operate correctly due to the switching action of the inverters output stage. Also some audio amplifiers and radios may produce a low frequency background buzz due to the inverters output switching components. 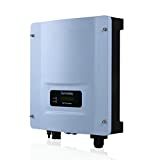 The Sine Wave Solar Power Inverter produces a high quality AC voltage waveform with low total harmonic distortion (THD) similar to what you get from your local electricity or utility company. They are used when there is a need for clean sine wave outputs to operate sensitive devices such as electronic equipment, printers, copiers, and stereos, etc. Pure or true sine wave power inverters are required as standard by most electrical utility companies as part of a grid connected PV solar system. Sine wave inverters have a much higher cost than the previous types for the same wattage due mainly to their better internal electronic circuits. Their output voltage can be controlled either in square wave mode or in pulse width modulated (PWM) mode. In PWM pure sine wave circuits, the output voltage and frequency are controlled by varying the duty cycle of the high frequency pulses. Chopped voltage then passes through an output LC low pass filter network to produce a clean sinusoidal output. This allows the output voltage and frequency to be well controlled, ensuring that any AC load within the inverters power limits will operate properly. Pure sine wave inverters are generally not suitable for home solar power as their cost is too expensive and are inefficient, instead “stepped” sine wave inverters are used. Only the top end high quality inverters actually supply a pure sine wave as their output waveform. Also some of the higher end pure sine wave inverters have solar tracking circuits or maximum power point tracking (MPPT) built-in, in order to optimally operate a motorised solar tracking PV array. Most sine wave models available on the market produce a variation on the modified sine wave inverter above. Their voltage output is not a pure sinusoid but they can operate almost anything that can be connected to the local grid. When it comes to efficiency, sine wave inverters perform better than pure sinusoidal inverters. After the solar PV panels themselves, Solar Power Inverters are the next most important part of a grid connected PV system and therefore the DC input power rating of the inverter should be selected to match the PV panel or array. Generally, power inverters are selected for a particular solar system based on the maximum load, the maximum surge required, AC output voltage required, input battery voltage and any optional features needed. The size of an inverter is measured by its maximum continuous output in watts and this rating must be larger than the total wattage of all of the AC loads connected at the same time. Also electrical appliances such as washing machines, dries, fridge’s and freezers which use electric motors require more power to start themselves than they require to run. This high starting power consumption can be more than twice the normal power consumption so this must be considered when sizing an inverters wattage. Most power inverters are capable of delivering three to five times their rated wattage for short term surges and overload conditions. Lets assume that we have calculated the total AC power consumption of our home and that we would need a 2,500W or 2.5kW solar inverter. The PV solar panels we are interested in are 24 volt monocrystalline silicon panels rated at 140 Watts peak. Then dividing 2,500W by 140 watts means that 18 PV panels will be needed, yielding 2,520 watts in total. But how do we connect these 18 panels to the inverter. We know from previous tutorials that PV solar panels can be connected together just like batteries, and in a series combination the voltage adds, with a constant current through each panel, and in a parallel combination the current adds with a constant voltage across each panel. We first need to calculate how many modules can be connected together in a series branch. The datasheet for our inverter tells us that the maximum power point tracking (MPPT) input voltage is between 175 and 480 volts at a maximum current of 15 amps. The open circuit voltage (Voc) of each 24 volt PV panel at 25oC is given as 36.8 Volts. Then the maximum number of panels we can connect together in a single series branch is calculated as: 480/36.8 = 13 panels. Likewise, the minimum number of 24 volt PV panels required to keep the MPPT tracking voltage above the minimum 175 volts is there calculated as: 175/24 = 7.3, or 8 panels. Then to keep within the inverters input voltage limits for our simple example so that the PV array voltage is not lower than 175V or greater than 480V requires an array branch of between 8 and 13 solar PV panels. Since our calculated array consists of 18 panels, two branches or strings of 9, 24 volt PV panels each is acceptable. The short circuit current, Isc of our 24 volt monocrystalline silicon panels is given as 5.8 amps. Two branches will therefore give a total maximum current of 11.6 amps, well within the inverters specification. So to determine the number of panels that can be connected on one series PV branch, check that the sum of the open circuit voltage of all the panels does not exceed the maximum power point tracking DC input voltage and that the minimum number of panels in the series branch does not fall below the minimum MPPT voltage not forgetting that the voltage in a series branch varies up and down with temperature. Also check that the short circuit current (Isc) of the array is less than the maximum DC input current of the power inverter. In the next tutorial about Solar Power, we will look at the advantage of using Deep Cycle Batteries compared to normal automotive batteries and how to connect them into our home solar power system for use in a stand alone or grid tied PV system. If a homeowners wants to know how many inverters he is gonna need how can be measure it? Depends on the configuration of the array, and the expected current generated. I have been looking all over for blueprint ready PV symbols such as your Solar Power Inverter Symbol above that I can use in my DIY permit application to the San Bernardino building dept. Do you have, or where can I find them all in one place for use in my SketchUp CAD program? Cannot find them in SketchUp’s 3D Warehouse. I suppose if I could find them, I could recreate and share them myself (assuming I can find a sinewave character somewhere). If you can not find a symbol, make your own. What’s up, just wanted to say, I loved this post. It was inspiring. Keep on posting! One of the better pieces i’ve seen in the week.